Objective To assess the added value of neurite orientation dispersion and density imaging (NODDI) compared with conventional diffusion tensor imaging (DTI) and anatomical MRI to detect changes in presymptomatic carriers of chromosome 9 open reading frame 72 (C9orf72) mutation. Methods The PREV-DEMALS (Predict to Prevent Frontotemporal Lobar Degeneration and Amyotrophic Lateral Sclerosis) study is a prospective, multicentre, observational study of first-degree relatives of individuals carrying the C9orf72 mutation. Sixty-seven participants (38 presymptomatic C9orf72 mutation carriers (C9+) and 29 non-carriers (C9−)) were included in the present cross-sectional study. Each participant underwent one single-shell, multishell diffusion MRI and three-dimensional T1-weighted MRI. Volumetric measures, DTI and NODDI metrics were calculated within regions of interest. Differences in white matter integrity, grey matter volume and free water fraction between C9+ and C9− individuals were assessed using linear mixed-effects models. Results Compared with C9−, C9+ demonstrated white matter abnormalities in 10 tracts with neurite density index and only 5 tracts with DTI metrics. Effect size was significantly higher for the neurite density index than for DTI metrics in two tracts. No tract had a significantly higher effect size for DTI than for NODDI. For grey matter cortical analysis, free water fraction was increased in 13 regions in C9+, whereas 11 regions displayed volumetric atrophy. Conclusions NODDI provides higher sensitivity and greater tissue specificity compared with conventional DTI for identifying white matter abnormalities in the presymptomatic C9orf72 carriers. Our results encourage the use of neurite density as a biomarker of the preclinical phase. Frontotemporal lobar degeneration (FTLD) and amyotrophic lateral sclerosis (ALS) are two degenerative diseases that share common genetic causes, the most frequent being a GGGGCC repeat expansion in the chromosome 9 open reading frame 72 (C9orf72) gene.1 2 Early stages of C9orf72 carriers have received much interest, because presymptomatic carriers represent the optimal target population for the development of new disease-modifying treatments against FTLD and ALS. Anatomical MRI-derived metrics, such as volumetry, have revealed brain atrophy in presymptomatic individuals who carry the C9orf72 mutation (C9+).3–9 Three studies5 6 8 also detected disruptions of white matter integrity using diffusion tensor imaging (DTI) technique, whereas another study failed to identify such abnormalities.4 The DTI results are promising but with limitations. First, DTI metrics, such as fractional anisotropy (FA), are non-specific biomarkers of microstructural architecture.10 11 For instance, FA changes could be underpinned by combinations of neurite density reduction and orientation dispersion changes.12 Besides, DTI is limited when an image voxel suffers from partial volume effect. Neurite orientation dispersion and density imaging (NODDI) was proposed to characterise alterations of microstructural integrity with higher tissue specificity.12 NODDI derives a neurite density index (NDI) and orientation dispersion index (ODI) to quantify the density and angular variation of neurites, respectively. In addition, NODDI includes a free water fraction (FWF) parameter designed to capture the contamination of tissues by free water at the microstructural level. In the present work, we assess the added value of NODDI compared with conventional DTI and anatomical MRI to detect changes at the presymptomatic phase of C9orf72 disease. We hypothesise that NDI and ODI offer higher sensitivity than FA, mean diffusivity (MD), axial diffusivity (AD) and radial diffusivity (RD) for detecting white matter abnormalities. Additionally, FWF is compared with volumetry and may provide complementary information for identifying grey matter changes. Eighty-six first-degree relatives of C9orf72 mutation carriers from 48 families were enrolled in an ongoing national multicentric study (Predict to Prevent Frontotemporal Lobar Degeneration and Amyotrophic Lateral Sclerosis (PREV-DEMALS)) between October 2015 and October 2017. Written informed consent was obtained from all participants. At inclusion, asymptomatic status of participants was ascertained based on relatives’ interview, neurological examination, and the normality of behavioural scales and neuropsychological scores, taking into account age and educational level. In the present study, 67 neurologically healthy participants, who underwent a single-shell diffusion-weighted image (DWI) sequence, a multishell DWI sequence and a three-dimensional T1-weighted (3DT1) sequence, were included in the analyses. C9orf72 genetic status was determined by repeat-primed PCR on lymphocytes DNA. Thirty-eight C9+ participants carried a pathogenic expansion (>23 GGGGCC repeats); 29 control participants did not carry this expansion (C9−). The characteristics of the study population are shown in table 1. Demographic characteristics and clinical tests were compared between groups using the χ2 test for dichotomous and categorical variables or Mann-Whitney test for numerical variables. There was no statistical difference between C9+ and C9− regarding age at inclusion (p=0.18), gender (p=0.65) and clinical scores (Mini-Mental State Examination, p=0.83; Mattis Dementia Rating Scale, p=0.37; Frontal Assessment Battery, p=0.40). All MRI acquisitions were performed on a 3 T MRI system (Siemens Prisma Syngo 3T) in a single centre (Paris) belonging to the harmonised national network of the Centre d’Acquisition et de Traitement d’Images (http://cati-neuroimaging.com/).13 The Centre d’Acquisition et de Traitement d’Images performed onsite visits for the set-up of imaging protocols and regular follow-up. Each participant underwent a 3DT1 sequence with the following parameters: voxel size 1.1×1.1×1.1 mm3; echo time (TE)/repetition time (TR)=2.93/2200 ms; bandwidth=240 Hz. One single-shell DWI sequence with two repeats was acquired for DTI with the following parameters: voxel size 2.5×2.5×2.5 mm3; TE/TR=90/7300 ms; bandwidth=1580 Hz; 64 diffusion-weighted directions, b-value=1000 s/mm2, 9 T2-weighted images (b-value=0 s/mm2, referred to as b0 image). One field map image was acquired to estimate the susceptibility-induced off-resonance field. One three-shell DWI sequence with two repeats was acquired with reversed phase encoding directions for the NODDI model: voxel size 2×2×2 mm3; TE/TR=70/3000 ms; bandwidth=2090 Hz; 60, 32 and 9 diffusion-weighted directions at b-value=2200, 700 and 300 s/mm2, respectively; 13 b0 images. Of note, the DTI analysis was based on the single-shell data (b=1000 s/mm2). Indeed, DTI model is known to be a poor representation of the DWI signals at the high b-value (>2000). On the other hand, the low b-values (300 and 700) are acquired at prolonged TE designed to accommodate the high b-value. So these low b-values data are not representative of standard DTI data. Systematic quality checks of MRI results were performed by the Centre d’Acquisition et de Traitement d’Images as in previous work.6 All images were of satisfactory quality except for one T1 acquisition and one single-shell DWI acquisition from different individuals. These two images were excluded respectively from grey matter and white matter analyses. T1-weighted images were processed with the FreeSurfer image analysis suite (V.5.3; https://surfer.nmr.mgh.harvard.edu/), including skull stripping, intensity normalisation, cortical and subcortical segmentation, cortical surface reconstruction, and parcellation of the cortex using the Desikan-Killiany atlas.14 We studied grey matter volumes of 68 cortical regions of interest (ROIs) and 18 subcortical ROIs. The list of regions is provided in online supplementary-appendix e-1. All ROI volumes were normalised by total intracranial volume. The single-shell DWI data were processed with the same approach as in previous work.6 To summarise, head motion was corrected by rigidly registering the raw DWI volumes to the average b0 image, and an affine registration was used to correct for eddy current-induced distortions. The field map image was used to estimate the susceptibility-induced off-resonance field.15 A single multiplicative bias field from the averaged b0 image was estimated and applied to the single-shell DWI data.16 FA, MD, RD and AD were estimated using an iteratively reweighted linear least squares estimator.17 Each individual FA map was aligned onto the John Hopkins University (JHU) white matter tractography atlas template18 with a rigid plus deformable registration.19 MD, AD and RD maps were subsequently registered into the JHU atlas using the transformation field from the previous step. The regional mean values of FA, MD, AD and RD maps were extracted. The list of regions is provided in online supplementary -appendix e-2. From the pairs of images with reversed phase encoding directions, the susceptibility-induced off-resonance field was estimated using the topup tool.20 Besides, eddy current-induced distortions and subject movements were corrected by simultaneously modelling the effects of diffusion eddy currents and movements on the image using the eddy tool.21 The b-vector was subsequently corrected. The NODDI model was then fitted to the artefact-corrected data, generating NDI, ODI and FWF maps using the NODDI Matlab toolbox (https://www.nitrc.org/projects/noddi_toolbox). For white matter analysis, DTI model was applied to the middle-shell data (b-value=700 s/mm2) to generate the FA map, in order to estimate the transformation field from the native diffusion space to the JHU space. Then NDI and ODI maps were registered into the JHU space using the transformation field obtained from the previous step. Finally, the regional mean values of NDI and ODI were calculated. For grey matter analysis, the normalised skull-stripped T1 image in FreeSurfer conformed space was rigidly registered onto the first b0 image of the artefact-corrected multishell DWIs. Then the inverse transformation field was applied to register FWF map in the FreeSurfer conformed space with a linear interpolation. For subcortical ROI analysis, a two-voxel morphological erosion operator was performed on each segmented subcortical ROI.22 For cortical ROI analysis, FWF signal was projected onto cortical middle surface. The projected FWF value was calculated with a weighted average of signals from the seven intermediate surfaces, which were expanded at different fractions of cortical thickness (35%, 40%, 45%, 50%, 55%, 60% and 65%) from the white surface. Subsequently, the averaged middle surface was registered onto the FsAverage template in FreeSurfer conformed space using a surface-based registration method.23 The aim of the erosion and middle surface projection approach was to avoid the partial volume effect (ie, elimination of free water contamination at the edges of ventricle and the borders of the brain parenchyma). Finally, the regional mean values of FWF were extracted for further cortical and subcortical analyses. All statistical analyses were performed with R V.3.4.0 (The R Foundation). Structural and microstructural differences between C9+ and C9 − participants were assessed using linear mixed-effects models. We used real age, gender and group (ie, mutation status) as fixed effects and family membership as random effect measuring the difference between the average response in the family and in the whole population (online supplementary-appendix e-3). Likelihood ratio test was used to test each effect, and p values were corrected by the Benjamini-Hochberg method with a significance level of p<0.05. Besides, the effect size of each ROI between C9+ and C9− was also reported using Cohen’s f2. Effect sizes obtained for different models or metrics (eg, NODDI vs DTI) were compared using permutation tests with 10 000 iterations for significant ROIs. Figure 1 displays the altered white matter tracks after correction for multiple comparisons. Compared with C9−, C9+ showed extensive alterations in white matter integrity (ie, reduced NDI, elevated MD, AD and RD), involving several frontotemporal-related tracts (ie, bilateral inferior fronto-occipital fasciculus, bilateral inferior longitudinal fasciculus, right uncinate fasciculus, right anterior thalamic radiation, forceps minor) and both corticospinal tracts. Ten tracts were significantly altered in C9+ with NDI, and only five tracts with DTI metrics (MD, AD or RD). The results before correction for multiple comparisons were shown in online supplementary figure e-1. Effect size results confirmed that NDI was more sensitive than DTI metrics: among the 11 tracts in which significant differences were detected in either NDI or DTI metrics (MD, AD or RD), 7 tracts had higher effect size with NDI than with DTI metrics (figure 2). The effect size was significantly higher with NDI than with DTI for two of these tracts: left inferior fronto-occipital fasciculus (p=0.009) and right uncinate fasciculus (p=0.008). None of the tracts had a significantly higher effect size with DTI than with NDI. Effect size results were shown in online supplementary-table e-1. White matter alterations in C9orf72 mutation carriers. Colour-coded representation of p values corresponding to the associations of C9orf72 mutation with white matter integrity after correction for multiple comparisons. (A) Mean diffusivity (MD), (B) axial diffusivity (AD), (C) radial diffusivity (RD) and (D) NDI, neurite density index (NDI). Effect size of white matter alterations in C9orf72 mutation carriers. Effect size (Cohen’s f2) corresponding to the associations of C9orf72 mutation with white matter integrity. Only ROIs in which significance, after correction for multiple comparisons, was detected in either NDI or DTI metrics are displayed. ATR, anterior thalamus radiation tract; CST, corticospinal tract; DTI, diffusion tensor imaging; Fmajor, forceps major tract; Fminor, forceps minor tract; IFOF, inferior fronto-occipital fasciculus; ILF, inferior longitudinal fasciculus; L, left; NDI, neurite density index; R, right; ROI, region of interest; SLF, superior longitudinal fasciculus; SLFT, superior longitudinal fasciculus (temporal part); UF, uncinate fasciculus. Figure 3 displays altered cortical regions after correction for multiple comparisons. Compared with C9−, C9+ showed reduced cortical grey matter volume and elevated FWF. Thirteen ROIs were significantly altered with FWF (4 frontal, 1 temporal, 4 parietal, 3 occipital and the left insula) and 11 ROIs with volumetry (2 frontal, 5 temporal and 4 parietal ROIs). The results before correction for multiple comparisons were shown in online supplementary figure e-2. Figure 4 displays the effect sizes for the 21 regions that were significantly altered according to either FWF or volumetry. Among the 21 regions, the left insula (p=0.002), the lateral occipital cortex (p=0.001) and the left pericalcarine cortex (p=0.008) had a significantly higher effect size with FWF than with volumetry. Only the left temporal pole cortex showed significantly higher effect size with volumetry than with FWF (p=0.02). Effect size results were shown in online supplementary-table e-2. Cortical alterations in C9orf72 mutation carriers. 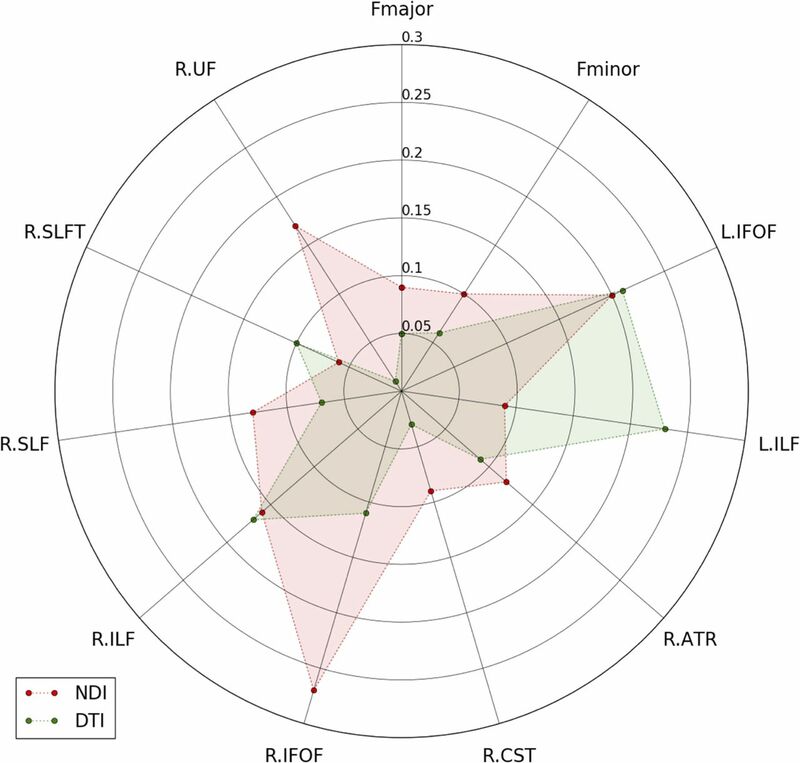 Colour-coded representation of p values corresponding to the associations of C9orf72 mutation with the cortical ROI measures ((A), ROI volume and (B) FWF, respectively) after correction for multiple comparisons. FWF, free water fraction; ROI, region of interest. Effect size of cortical alterations in C9orf72 mutation carriers. Effect size (Cohen’s f2) corresponding to the associations of C9orf72 mutation with the cortical ROI measures (ROI volume and FWF, respectively). Only ROIs in which significance, after correction for multiple comparisons, was detected in either volumetry or FWF are displayed. CMF, caudal middle frontal cortex; CUN, cuneus cortex; FUS, fusiform; FWF, free water fraction; INS, insula; IP, inferior parietal cortex; IT, inferior temporal cortex; L, left; LIN, lingual; LO, lateral occipital cortex; MOF, medial orbitofrontal cortex; PCC, pericalcarine; POC, postcentral cortex; PPC, pars opercularis cortex; PREC, precuneus; R, right; RMF, rostral middle frontal cortex; ROI, region of interest; SM, supramarginal cortex; SP, superior parietal cortex; TP, temporal pole cortex. Compared with C9−, C9+ showed subcortical volume reduction of the right thalamus after correction for multiple comparisons. FWF failed to detect any significant alterations (figure 5). The results before correction for multiple comparisons were presented in online supplementary figure e-3). The right thalamus did not show statistically higher effect size with volumetry than with FWF (p=0.062). Effect size results were shown in online supplementary-table e-3. Subcortical alterations in C9orf72 mutation carriers. 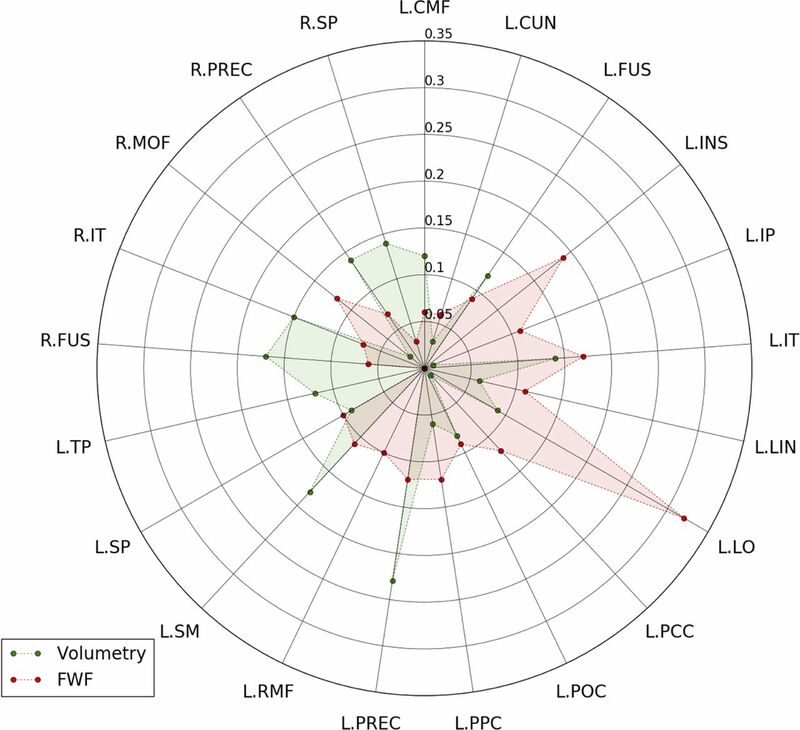 Colour-coded representation of p values corresponding to the associations of C9orf72 mutation with the subcortical ROI measures ((A) ROI volume and (B) FWF) after correction for multiple comparisons. FWF, free water fraction; ROI, region of interest. The current study, for the first time, compared NODDI with conventional DTI and anatomical MRI in a large cohort of presymptomatic C9orf72 carriers. There are three key findings. First, we demonstrate that NODDI provides higher sensitivity than DTI for detecting white matter microstructural changes. Second, the greater tissue specificity of NODDI suggests that the reduction of neurite density is a more likely cause of signal changes than the alterations of neurite orientation dispersion during the presymptomatic stage. Third, the pattern of FWF alterations slightly differs from that of grey matter volumetric atrophy, suggesting that both FWF and volumetry provide complementary information on the integrity of cortical and subcortical structures. When comparing the multishell DWI sequence with the standard single-shell DWI sequence, we hypothesised that NODDI could be more sensitive than conventional DTI for detecting white matter abnormalities during the presymptomatic stage. Previous works have shown that NODDI could be more sensitive than DTI for detecting white matter changes related to ageing24 or young-onset Alzheimer’s disease.25 Here, for the first time, we showed that NODDI outperformed DTI for identifying white matter abnormalities during the presymptomatic stage of a neurodegenerative disease. The spatial pattern of white matter changes is consistent with previous findings with conventional DTI.5 6 8 Specifically, reduced NDI was mainly found in the corticospinal tract and frontal-temporal related tracts during the presymptomatic stage for C9orf72 carriers, which were preferentially involved in symptomatic mutation carriers who develop FTLD, ALS or both. On the other hand, to the best of our knowledge, there has been no prior study using NODDI in C9orf72 disease, neither at the presymptomatic nor at the symptomatic stage. The interpretation of specificity for DTI metrics has been discussed,26 27 suggesting that RD and AD reflect, respectively, demyelination and axonal damage and both provide more specific information than FA. However, these interpretations were also argued in the literature.28 Compared with DTI, the more biophysically motivated NODDI model allows more direct analysis of independent microstructural effects: the loss of neurite density and the alteration of neurite orientation dispersion. This potential for greater tissue specificity has motivated application of NODDI in a few neurodegenerative disease studies.25 29–32 In young-onset Alzheimer’s disease, one study showed widespread NDI reduction and regional ODI reduction in the corpus callosum and internal capsule of patients.25 In Parkinson’s disease, another study observed reduced NDI in the substantia nigra and putamen of patients.31 In the present study, we detected widespread NDI decrease in the white matter, but no alteration of ODI (figure 1). This suggests that the reduction of neurite density, not the alterations of neurite orientation dispersion, is the predominant pathological process in white matter during the presymptomatic stage of C9orf72 carriers. Interestingly, similar reduction of neurite density within corticospinal tract has been found in patients with ALS.33 Our observation suggests that the neurite loss is the main pathological process, but this needs further histological confirmation. We note however that Grussu et al 32 have demonstrated, in the tissue specimen of multiple sclerosis, that ODI correlated well with histological measures of neurite orientation dispersion, and NDI with histological measures of neurite density. Mapping the free water in tissues is important in order to estimate the variations in extracellular volume (related to FWF) due to pathological processes.34 FWF has been applied in several neurodegenerative diseases. Using a bitensor model, FWF has been demonstrated as an imaging biomarker of progression of Parkinson’s disease in the posterior substantia nigra.35 36 Interestingly, a chronic treatment effect of rasagiline, an irreversible inhibitor of monoamine oxidase-B as a medical monotherapy, has been verified with FWF in the basal ganglia in Parkinson’s disease.37 These findings support the use of FWF as a promising biomarker in neurodegenerative diseases to evaluate the free water-related alterations. In the present study, FWF detected free water alterations mainly in the frontal and temporal lobes. This finding is consistent with previous studies using volumetric measure.3–9 The unique differences detected with FWF in the left insula and left lateral occipital lobe were also reported in literatures using volumetric measure.3–5 7 These suggest that macroscopic brain atrophy may accompany free water alterations inside the cortex. Surprisingly, FWF failed to show changes in subcortical structures, such as the thalamic atrophy where a significant effect of C9orf72 mutation was evidenced by volumetry. These findings suggest that distinct degenerative processes could occur in cortical and subcortical structures at the same time during the presymptomatic stage. Reliability of an imaging technique is an important issue for its use in clinical trials. We do not have test–retest scans in our participants. However, the reliability of NODDI has been assessed in previous studies.38 39 NODDI metrics were shown to have excellent reproducibility with coefficients of variation below 5% in all measured ROIs and even below 3% in the vast majority of regions.39 Furthermore, the reproducibility of NODDI metrics was shown to be comparable with that of conventional DTI.38 This, together with its higher sensitivity to detect white matter alterations, supports the use of NODDI in clinical trials. Our study has the following limitations. First, the cross-model comparison between NODDI and DTI used two different DWI acquisitions, which were performed within 1 week sequentially for each participant. However, the single-shell and multishell DWI sequences were optimised for DTI and NODDI model, respectively. Thus, this systematic comparison helps clarify the added value of a longer but clinically feasible multishell diffusion sequence. Second, caution should be exercised in diffusion MRI-based cortical analysis. NODDI, by construction, accounts for partial volume effects from cerebrospinal fluid (CSF) contamination, thus minimising the influence of atrophy on the NODDI metrics. Moreover, a recent paper40 has explicitly looked at the influence of cortical thickness on NODDI metrics, showing that the majority of changes in NODDI metrics persisted following adjustment for cortical thickness. 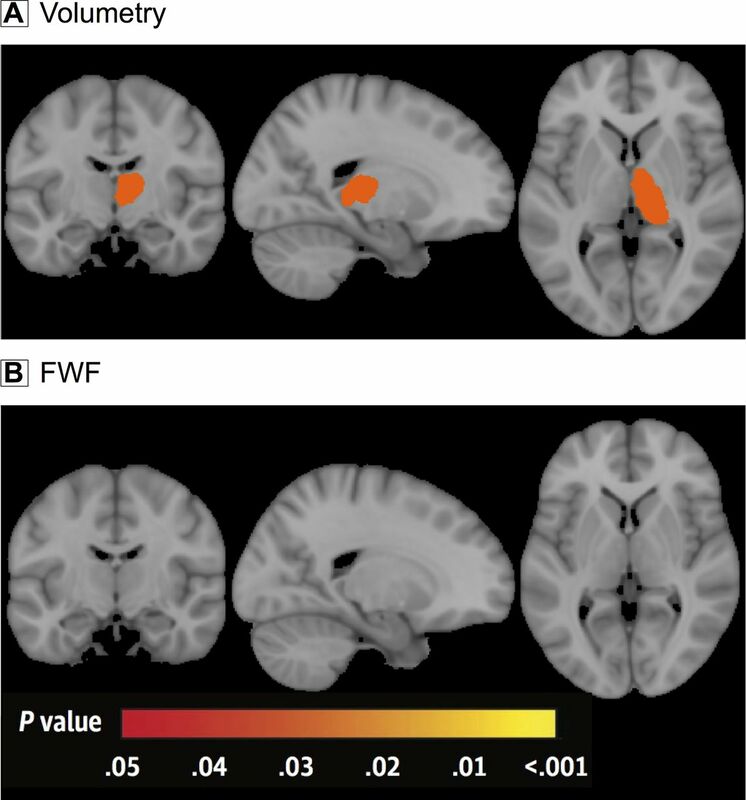 Nevertheless, the cortex is a thin structure compared with the resolution of diffusion MRI, and partial volume effect may impact on the computation of regional FWF measures. Although we implemented specific image processing procedures to mitigate partial volume effects, it is still possible that some partial volume effect remains, impacting on FWF estimates. In conclusion, this study evaluated the added value of NODDI in the detection of brain microstructural changes in presymptomatic C9orf72 carriers. NODDI offers higher sensitivity compared with conventional DTI for detecting white matter integrity abnormalities. Moreover, it offers the potential to reveal a more specific substrate of white matter damage, suggesting here that it consists mainly of reduced neurite density. Our results encourage the use of a multishell DWI sequence in clinical studies and highlight the potential use of NODDI to track the presymptomatic stage of neurodegenerative diseases.
. Neurite Orientation Dispersion and Density Imaging (NODDI) highlights axonal degeneration of the motor tracts as the core feature underlying Amyotrophic Lateral Sclerosis. (S53.008). Neurology 2017;88(Suppl 16).
. Scan-rescan reproducibilityof neurite microstructure estimates using NODDI 2012;8. Collaborators The PrevDemAls study group includes: Eve Benchetrit, BSc (Hôpital Pitié-Salpêtrière, Paris, acquisition of data), Hugo Bertin, BSc (Hôpital de la Salpêtrière, Paris, acquisition of data), Anne Bertrand, MD (Hôpital Pitié-Salpêtrière, Paris, acquisition of data), Anne Bissery, MD (Hôpital Pitié-Salpêtrière, Paris, acquisition of data), Stéphanie Bombois, MD (CHU Roger Salengro, Lille, acquisition of data), Marie-Paule Boncoeur, MD (CHU Limoges, acquisition of data), Pascaline Cassagnaud, MD (CHU Roger Salengro, Lille, acquisition of data), Mathieu Chastan, MD (CHU Charles Nicolle, Rouen, acquisition of data), Yaohua Chen, MD (CHU Roger Salengro, Lille, acquisition of data), Marie Chupin, PhD (CATI, ICM, Paris, acquisition of data), Olivier Colliot, PhD (ICM, Paris, acquisition of data), Philippe Couratier, MD (CHU Limoges, acquisition of data), Xavier Delbeucq, PhD (CHU Roger Salengro, Lille, acquisition of data), Vincent Deramecourt, MD (CHU Roger Salengro, Lille, acquisition of data), Christine Delmaire, (CHU Roger Salengro, Lille, acquisition of data), Emmanuel Gerardin, (CHU Charles Nicolle, Rouen, acquisition of data), Claude Hossein-Foucher, (CHU Roger Salengro, Lille, acquisition of data), Bruno Dubois, (Hôpital Pitié-Salpêtrière, Paris, acquisition of data), Marie-Odile Habert, (Hôpital Pitié-Salpêtrière, Paris, acquisition of data), Didier Hannequin, (CHU Charles Nicolle, Rouen, acquisition of data), Géraldine Lautrette, (CHU Limoges, acquisition of data), Thibaud Lebouvier, (CHU Roger Salengro, Lille, acquisition of data), Isabelle Le Ber, PhD (Hôpital Pitié-Salpêtrière Salpêtrière, Paris, acquisition of data), Stéphane Lehéricy, (Hôpital Pitié-Salpêtrière Salpêtrière, Paris, acquisition of data), Benjamin Le Toullec, PhD (ICM, Paris, acquisition of data), Richard Levy, (Hôpital Pitié-Salpêtrière Salpêtrière, Paris, acquisition of data), Olivier Martinaud, (CHU Charles Nicolle, Rouen, acquisition of data), Kelly Martineau, PhD (CATI, ICM, Paris, acquisition of data), Marie-Anne Mackowiak, (CHU Roger Salengro, Lille, acquisition of data), Jacques Monteil, (CHU Limoges, acquisition of data), Florence Pasquier, (CHU Roger Salengro, Lille, acquisition of data), Grégory Petyt, (CHU Roger Salengro, Lille, acquisition of data), Pierre-François Pradat, (Hôpital Pitié-Salpêtrière, Paris, acquisition of data), Assi-Hervé Oya (BSc, Hôpital Pitié-Salpêtrière, Paris, acquisition of data), Daisy Rinaldi, PhD (Hôpital Pitié-Salpêtrière, Paris, acquisition of data), Adeline Rollin-Sillaire, (CHU Roger Salengro, Lille, acquisition of data), François Salachas, (Hôpital Pitié-Salpêtrière, Paris, acquisition of data), Sabrina Sayah, PhD (Hôpital Pitié-Salpêtrière, Paris, acquisition of data), David Wallon, MD, (CHU Rouen, acquisition of data). Contributors JW had full access to all the data in the study and takes responsibility for the integrity of the data and the accuracy of the data analysis. JW, OC, AB, ILB, HZ, SD, AR: study concept and design. JW, HZ, DCA, SD, AR, DR, MH, PC, DH, FP, JZ, OC, ILB, AB: acquisitions, analysis or interpretation of data. JW, OC, ILB, AB: drafting of the manuscript. JW, OC, ILB, AB: critical revision of the manuscript for important intellectual content. JW: statistical analysis. OC, ILB: obtained funding. OC, AB, ILB: administrative, technical or material support. OC, AB, HZ, DCA, ILB: study supervision. Funding This study was funded by Assistance Publique-Hôpitaux de Paris (Clinical Research and Development Department), grant ANR/DGOS PRTS 2015-2019 PrevDemAls (to ILB) and by 'Investissements d’avenir' ANR-10-IAIHU-06 (Agence Nationale de la Recherche-10-Investissements-Avenir-Institut-Hospitalo-Universitaire-06). EPSRC Grants EP/L022680/1 EP/M020533/1 and EP/N018702/1 support DCA and HZ’s work on this topic. OC is supported by a 'Contrat d’Interface Local' from Assistance Publique-Hôpitaux de Paris (AP-HP). The study was conducted with the support of the Centre d’Investigation Clinique (CIC 1422) and the Centre pour l’Acquisition et le Traitement des Images (CATI) platform, at IHU-A-ICM, Paris, France. China Scholarship Council supports JW’s work on this topic. This study has been registered on the website http://clinicaltrials.gov/ under trial registration number NCT02590276. The funding sources had no role in design and conduct of the study; collection, management, analysis and interpretation of the data; preparation, review or approval of the manuscript; and decision to submit the manuscript for publication. Competing interests Competing financial interests unrelated to the present article: OC and SD are funded by European Union’s Horizon 2020 research and innovation programme under grant agreement no 666992 (EuroPOND) and no 720270 (HBP SGA1). SD is funded by the European Research Council (ERC) under grant agreement no 678304. PC received consultant fees from Boehringer Ingelheim and funding for his institution from Cytokinetics. Ethics approval This study was approved by the Comité de Prévention des Personnes Ile de France VI of the Hôpital Pitié-Salpêtrière.